Sakai Community DocumentationSakai 19 User Guide (English) RubricsHow do I edit a rubric? Note: You may only edit rubrics which are local to your site, and which have not been associated with an item for grading. Once a rubric is in use, it will appear with a lock icon next to it, indicating that it cannot be edited. Select the title of the rubric you would like to edit to expand it. Remember! Locked rubrics may not be edited. The Lock icon indicates that a rubric is associated with an activity in the site and it cannot be edited. If you need to edit a locked rubric, you should either detach it from the activity where it is being used, or make a copy of the rubric and edit the copy. You may view and edit the rubric from this screen. 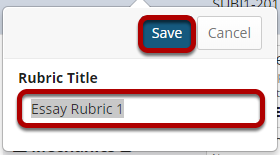 Select the Edit icon next to the rubric title to rename it. Modify the title and Save. 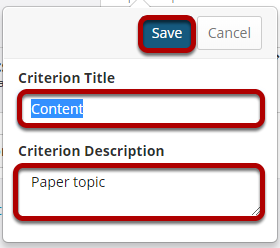 Select the Edit icon next to a criterion to modify that criterion. Modify the criterion title and/or description and Save. Select the Edit icon next to a rating to modify that rating. 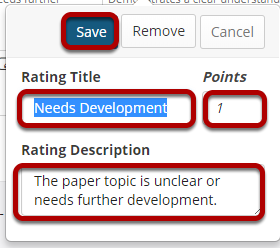 Modify the rating title, points, and/or description and Save. Note: If you would like to delete a rating level, you may do so by selecting the Remove button here. Prev: How do I add a rubric to my site? Next: How do I copy a rubric?